All of the cottages are self-contained and furnished in an individual style with such features as vaulted ceilings with exposed roof trusses, beam ceilings, wooden floor boards and painted natural stone walls. The cottages have woodburning stoves and oil fired central heating. They include flat screen modern televisions, freeview digital boxes and DVD players and free wifi. Each kitchen is equipped with range of modern wall and base cupboards, electric cookers, microwave ovens, fridges, dishwashers and separate freezers (except Voley Mill which has a full height fridge/freezer). All of the cottages had new modern white bathroom suites fitted in 2008 and have been refurbished in 2011. All the bedrooms have built-in wardrobes/cupboards. Secure and safe Play Field with swings, slide, play house and goal posts for outdoor games, picnicking and relaxing. Since we are at the end of a private lane, traffic is not an issue. Cots & high chairs available FOC. Cot linen/bedding not provided. Cottages will be available from 3.30pm on your arrival day and must be vacated by 10am on your departure day. We are flexible on these times out of season, please ring to check. Bed linen is included, as is gas, oil and electricity and your first basket of logs (then £5 per basket). Cot linen/bedding is not provided. Please see agent's site for details of towel hire. We will do all that we can to make your stay enjoyable, relaxing and memorable so just ask if there is anything else you would like that is not mentioned on this page. We have links with many local suppliers and activity providers. We provide free Broadband so that visitors can maintain contact with the outside world via their laptop. Cellphones do not work in the farm area, though reception is possible at the top of the hill. 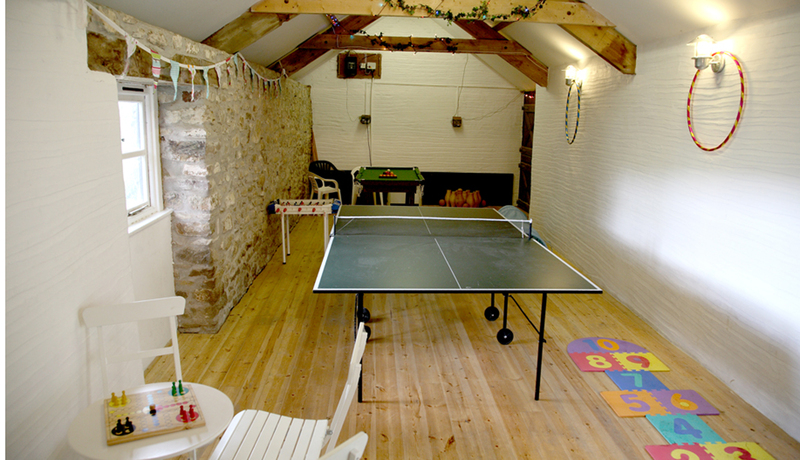 Games Room This is housed in one of the courtyard barns and has a table tennis table,table football, children's snooker table and a skittle alley.